My New Picnic Essential: S'MOREOs! This weekend, we honor the beginning of our United States of America. Many of us will celebrate this important day with parades and picnics. It's also a great time to start our summer activities and spend some time with family and friends! S'mores are a staple at picnics and bonfires all year round. I can take 'em or leave 'em. Not the hugest fan of the graham cracker element. (I think they invoke memories of learning-to-eat-solid-food toddlers -- you know. Gooey, soggy...eww). Anyway, hope I didn't ruin your summertime treat for you! ;-) Do not fear, I've discovered another option for which I am giddy over! 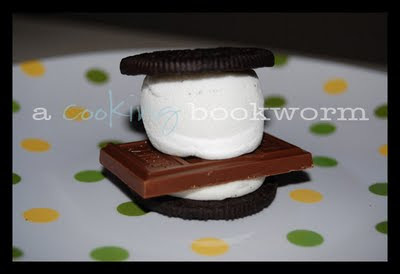 Ohhhhh.... thank you, random facebook photo, that introduced me to this double chocolatey, sweet oreo cream version! My husband is the coffee drinker in our house. I've tried the dark brew many different ways, but just don't like it. I figure if I didn't develop the coffee habit in college, while pulling cramming-for-exam-all-nighters, I never will. 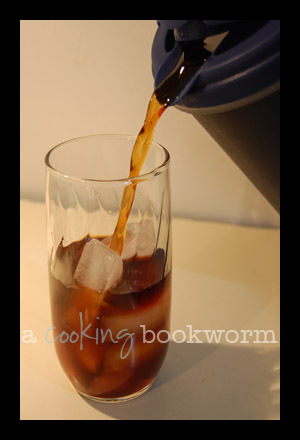 Hubby also likes iced coffee, but has never tried making it at home. He says chilled down coffee with ice cubes just isn't the same. So, when I saw Ree Drummond's (aka Pioneer Woman) recipe for iced coffee, I thought I'd attempt the cold concoction as a surprise for the man I love. First of all, PW's recipe and instructions were great. However, the proportions (even halved) were just too much for this 1-coffee-drinker household. It really made a bit of a mess. 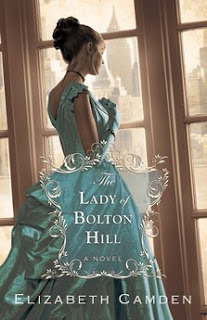 I had the opportunity, through Bethany House Book Reviewers, to read and review The Lady of Bolton Hill by Elizabeth Camden. When Clara Endicott and Daniel Tremain's worlds collide after twelve years apart, the spark that was once between them immediately reignites. But time has changed them both. As they face a painful reckoning, can they withstand the cost of their convictions while their hearts--and lives--hang in the balance? I’m going through a string of books right now that just aren’t holding my interest. The back cover teaser sound so good…the covers look so pretty, but I’m coming away disappointed in the stories. Hundreds of miles from home, Susannah faces an uncertain future as a mail-order bride on the untamed Dakota prairie. When her parents die suddenly, and no suitors call, Susannah resigns herself to the only option available: becoming a mail-order bride. Agreeing to marry her pastor's brother, Jesse, Susannah leaves the only home she's ever known for the untamed frontier of the Dakota Territory. Her new husband is more loving and patient with her than she believes she deserves. Still, there is also a wildness to him that mirrors the wilderness surrounding them. And Susannah finds herself constantly on edge. But Jesse's confidence in her-and his faith in God's perfect plan-slowly begin to chip away at the wall she hides behind. When she miscarries in the brutal Dakota winter, Susannah's fledgling faith in herself and in God begins to crumble. Still, Jesse's love is unwavering. Just when it seems like winter will never end, Susannah finally sees the first tentative evidence of spring. And with it, the realization that more than the landscape has changed. She looks to the future with a renewed heart. Yet in her wildest dreams, she couldn't predict all that awaits her. Catherine Richmond was focused on her career as an occupational therapist till a special song planted a story idea in her mind. That idea would ultimately become Spring for Susannah , her first novel. She is also a founder and moderator of Nebraska Novelist critique group and lives in Nebraska with her husband. I thought Catherine's debut novel, Spring for Susannah , was an enjoyable read. Sticking Susannah's shy personality and Jesse's exuberance in a cramped soddy gives the traditional mail-order bride storyline a fresh perspective. Susannah slowly begins to trust Jesse and realizes he loves her. Truly loves her. But when Jesse feels he must leave in order to provide for Susannah, he learns the hard way that Susannah is stronger than he thought and they can work together to build their homestead. My only real problem with the book is the physical detail of Jesse and Susannah's relationship. I don't quite know how to share this without sounding negative. I truly enjoyed the story! Jesse and Susannah are married, so the written romance is not really wrong, but I still felt uncomfortable. I guess I feel that what my husband and I share is a special gift from God - something that we are careful not to share publicly with others. I think that writing too much detail cheapens that gift, making it feel less special. I just think our Christian authors need to be careful. I'm afraid I wouldn't want my daughter - or any unmarried woman - to read it. If I feel uncomfortable sharing a book with my mom or mother-in-law, I think too much detail was given. Otherwise, Catherine's debut read more like an author who has been published many times. 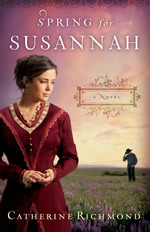 Spring for Susannah was well-written and romantic, combining stories in my imagination like Love Comes Softly , Sarah, Plain and Tall , and Little House . Don't forget to connect with A Cooking Bookworm! Thank you to Catherine, through Amy and the Litfuse Hens, for sending me a copy to read and review! Click below to ENTER for your chance to WIN! Also reviewed on Amazon and Christianbook. Click HERE to see what other bloggers are saying about Spring for Susannah ! I had a very difficult time getting into Too Rich for a Bride . I just couldn’t connect with Ida. Right from the very start, she rubbed me the wrong way. I’m old fashioned. I don’t have anything wrong with women working or doing well in business, but women with the a-woman-can-do-anything-a-man-can-do-and-probably-better attitude turn me off. Never good when the main character annoys you. Hard to get past that. I read Mona’s first book in this series, Two Brides Too Many , quite awhile ago, but couldn’t remember Mollie O’Bryan’s character. This also made me feel lost, as I really wasn’t sure what her ‘business’ was. So…I had no idea what in the world Ida was doing every day. I just felt like I was forcing myself to turn the next page, and only got about 2/3 of the way through the book. Just because I struggled to like the main character, doesn’t mean you wouldn’t enjoy Too Rich for a Bride . The book has a nice western feel, along with a likeable landlady, two protective sisters, and two men vying for Ida’s hand – which one is the good guy, bad guy, right guy, wrong guy for her? All the right components for a great story – it just fell flat for me. You can read the first chapter of Too Rich for a Bride HERE. Thank you to Blogging for Books through Waterbrook Multnomah for sending me a copy to read and review! Also reviewed on Amazon and Christianbook. No giveaways at this time! Check back soon! Use Promo Code STMMMS7975 at checkout!